Three people, including two children from one family, died when a tornado destroyed Buffalo Hart the afternoon of April 19, 1927. Those killed were Lewis Harold, age 6, and Everett Eugene Hardy, six weeks old, the sons of Mr. and Mrs. Lewis Hardy, who farmed near Buffalo Hart; and Charles Crabtree, 54, a timber worker who refused to leave his home as the storm approached. The Journal published a vivid account of the Hardy family tragedy. A terrific crash was heard and the two story frame home of Mr. and Mrs. Lewis Hardy was blown off the stone foundation, raised into the air ten feet, and tossed into a heap upon the ground. When aid reached the Hardys, Harold was dead, a board having passed through his body, and Everett was dying. Mr. and Mrs. Hardy, and their 2 year old son, Clarence LeRoy, were buried in the debris. They were rescued and carried to the Presbyterian church. The Hardy barns, automobile and garage were wiped out with only a bare space left to show where they had once stood. The automobile picked up by the wind was hurled along with cows and mules, chickens and furniture, to a point 100 yards northeast of the home. Crabtree lived in an area known as Timberland, northeast of Buffalo Hart, the Journal said. He worked at a sawmill on a nearby farm, milling lumber from trees cleared from the grove that once dominated the area. “He was urged to flee to another house in the section but declined, declaring he did not fear the approaching storm,” the Journal story said. Twisting everything within its grasp the funnel shaped cloud picked up buildings in Timberland and carried them away, leaving the occupants covered with dirt, broken furniture and other debris. Crabtree was found buried in the wreckage of his home and was carried to the church with others who had been injured, and from there placed aboard a special train and died on the way to Springfield. Only two homes in Buffalo Hart escaped damage. The main floor of the Buffalo Hart Presbyterian Church was unusable, but the basement was quickly converted into a shelter for refugees from Timberland and elsewhere. Aside from rescue volunteers and emergency crews, sightseers flooded into Buffalo Hart the day after the storm. “Difficulty was experienced from keeping the visitors from taking souvenirs,” the Journal reported. All last night the town was in darkness. Only an occasional flash of light from a flashlight could be seen. A few lanterns were used, but most of the residents spent the night talking to others in some demolished building that could not be used for sleep. In fact, there was very little sleep obtained by Buffalo Hart residents. 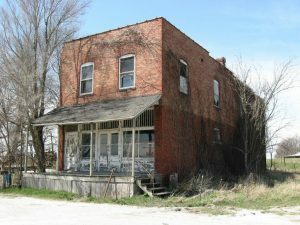 The surviving members of the Lewis Hardy family moved later to Fulton County. At least three are buried at Laurel Hill Cemetery in Havana. They are Lewis Hardy (1880-1948), his wife Lonnie* (1894-1961) and their son Clarence LeRoy (1925-94). Both Lonnie and Clarence were badly injured in the storm, but recovered. *Mrs. Hardy’s first name is in some question. The Illinois State Journal’s tornado coverage reports her name as “Jennie,” while the 1930 U.S. Census gives it as “Vannie.” SangamonLink believes “Lonnie,” as listed on Findagrave.com, is most likely correct. 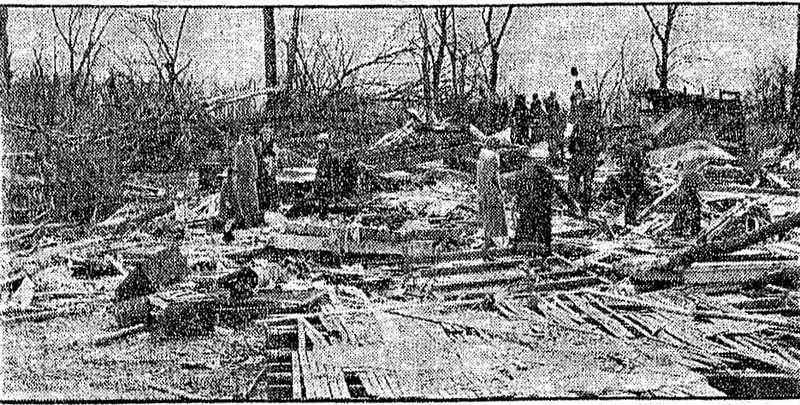 The three Buffalo Hart victims were among 19 people killed by the 1927 tornado. Elsewhere in Sangamon County, Effie Moore, 67, a housekeeper on a farm south of Loami, was fatally injured when the storm wrecked the home where she worked. Deaths and major property damage also were reported in Cornland, Mount Pulaski, and Chestnut, and seven people died in Greene County. Among them was 24-year-old Centerville schoolteacher Annie Keller, who was struck by debris while making sure her students were safe. Lorado Taft sculped a statue of Keller that stands today in White Hall. This entry was posted in Communities, Disasters. Bookmark the permalink.